ePhilanthropy is an ongoing process of communicating, educating, cultivating, and soliciting nonprofit supporters to build and enhance stronger relationships. It has become such a powerful tool that many of the most seasoned professionals have not only learned new skills but have also completely reevaluated how they approach almost every aspect of fundraising. Designed to be an everyday reference for nonprofit managers, staff, and volunteers, Nonprofit Internet Strategies is a practical manual written in a language that is not technical but, instead, rooted in the language of nonprofit staff members and focused on the everyday management issues they face. It helps all types of charitable organizations analyze and select best practices for developing multiple Internet strategies to integrate with their traditional marketing, communications, and fundraising methods. 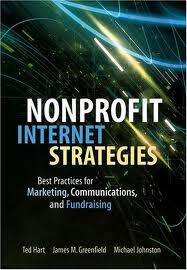 Nonprofit Internet Strategies is a powerful tool for nonprofit managers and everyone leading a nonprofit organization in marketing, communications, and fundraising, as well as information technology.